Need to keep your hedges and bushes in great shape? 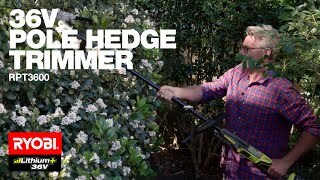 The RYOBI 36V pole hedge trimmer is your answer to dealing with long, straggly hedges that are just out of reach. Offering petrol performance without the hassle, you’ll be impressed with the power and results you get with this pole hedge trimmer. And it all comes with the convenience of cordless, so you never have to worry about cutting through a cord! All this means you can trim your hedges down to shape without worrying about getting caught or stuck in tricky limbs. This console fits in with your existing range of 36V outdoor power tools, so you can simply click in your battery and you’re ready to go. Ready to whip your yard into shape? Get the RYOBI 36V pole hedge trimmer console from your local Bunnings Warehouse today. 36V provides a real power alternative to petrol and electric gardens tools with a push of a button. Range features more power, high efficiency and an increased run time. With a vast selection of gardening tools in the range, there is a Ryobi product to suit every green thumb task.